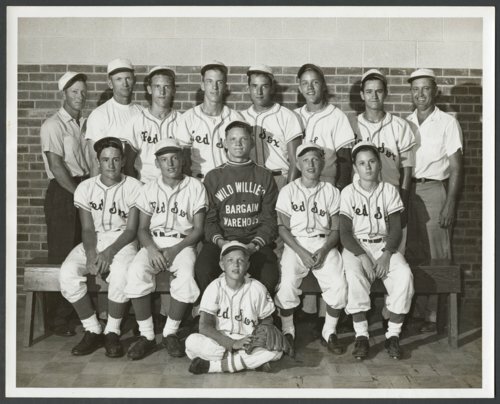 The Northwest Red Sox team of the Shawnee County Amateur Baseball Association's Pony League is shown in this photograph. Team members came from the Rossville, Silver Lake, and Seaman school districts. Pictured in the back row are (l to r): C. J. "Doc" Dillon (manager); Don Kirkwood (coach); Mike Tipton; Arlen Kirkwood; Doug Kelsey; Dwight Martinek; George Randall; and Butch Nixon (coach). Seated on the bench are (l to r): Michael Pottorf; Dana Rasch; Art Campbell; Steve Dillon; and Steve Keeler. Danny Dillon, the team's bat boy, is seated in the front. Members of the team not in the photo were Monty Gerren, Steve McDowell, and Terry Bettis. The Red Sox finished third in the Pony League standings, with a record of 16-3. Digital reproduction of the photo was accomplished through a joint project sponsored by the Kansas Historical Society and the Shawnee County Baseball Hall of Fame.